Last weekend we went to see various friends, and I did some baking to take along as presents. In my dim and distant youth, the appropriate present whenever you visited someone was always a bottle of wine. Whatever the time or occasion, a bottle of booze would crack it. Now that we have all accumulated offspring, it sometimes seems a bit mean to take a present that excludes half the family (although no doubt the parents are always grateful for wine). Cooking for friends also means you might get to try a couple before giving the rest away, with less risk of snarfing the entire tin. So with afternoon visits planned to two families, and my own children to entertain, we got baking. 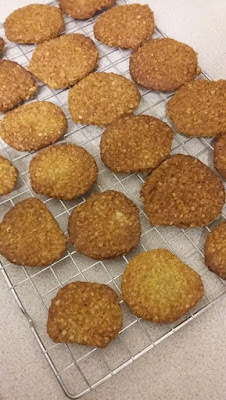 My son was dead set on cooking biscuits, so we started with a version of the New Zealand Biscuits, also known as Anzac Biscuits, from the venerable and multi million selling Hamlyn All Colour Cookbook. The Hamlyn All Colour Cookbook was a colossus when first published in 1970, back in the days when Mary Berry was young, aspic was all the rage and a recipe involving fish, a can of condensed mushroom soup and a crushed bag of crisps counted as dinner. You can only take these biscuits as a present for people you know and love, because they tend to spread on the baking tray and look embarrassingly incompetent. But once you try them, the combination of oats, syrup and coconut means you forget what they look like and just want another several. 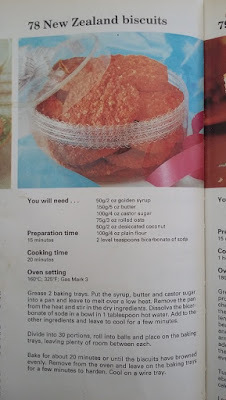 I don’t know if you can decipher the instructions in the photo, but basically put the syrup, Stork and sugar in a pan to melt over a gentle heat. Then stir in all the oats, coconut, flour and bicarbonate of soda. Take it in turns to spoon out a smallish ball of the mixture and roll it around in your hands. Pop the balls on a greased baking tray with plenty of room between each, and maybe give them a small squish so they’re a bit flatter. I usually get about 20 biscuits out of these quantities. Then bake for 14 to 20 minutes at 160 degrees C.
As ever in the Aga I put the tray on top of a rack on the floor of the roasting oven, bung in a cold shelf on the next set of runners up, and check on them after about 12 minutes. When you take the trays out, leave them to cool a bit before transferring to a wire rack. Then beat back biscuit thieves until you’ve eaten your own share. 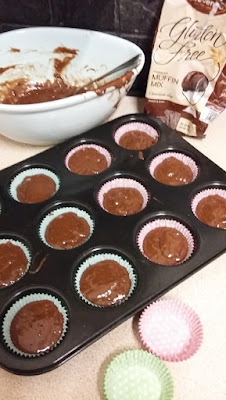 This one is really a bit of a cheat, as I used a bag of Provena “Gluten-Free Chocolate Muffin Mix with Chocolate Chips”. Usually I don’t buy bags of mixes as 1) I’m too mean 2) I don’t find it much hassle cooking from basic ingredients 3) I tend to be a bit suspicious of what might be added and 4) I tend to be more suspicious of whether they’re actually going to taste OK. Anyway I shoved the bag at the top of store cupboard, with a mental note to dig it out the next time we saw the gluten-free-friend-who-can-eat-chocolate, as opposed to the gluten-free-friend-who-can’t-eat-chocolate-either. And Saturday was the big day, so I duly gave it a go. The trickiest part by far was discovering the instructions, sneakily written in very small print just under the ingredients, which I’d assumed was some dense text about allergies. 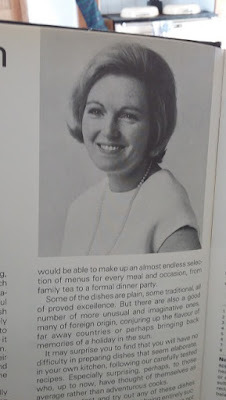 But no, it was useful stuff telling me to add 150 ml melted margarine and 3 eggs to the mix, combine it all, and divide into 8 large or 20 small muffin cups. Then bake at 200 degrees on the middle shelf of the oven for 13 to 17 minutes. 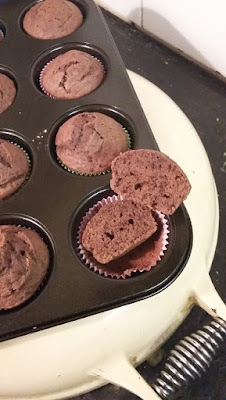 So I melted some Stork, mixed in the eggs, and decanted it into 16 normal size (as opposed to lorry-like) cupcake cases and trusted to luck and the Aga temperature. Currently our Aga has decided that the temperature guage on the front is an optional extra, so we’re flying even blinder than normal. Think they took about 14 minutes, so a bit longer than I’d expected. As you’ll see from the photo, the muffins rose nicely. They tasted light and fluffy and a bit unsubstantial. However, calling them chocolate chip muffins is a stretch, because any chocolate chips were invisible to the naked eye, and trust me, I looked. The eggs and Stork I used to make up the muffins cost 4p per muffin. However, I’ve just checked online, and if you want to buy a bag of the muffin mix, it costs £3.79 for 300g from Holland & Barrett. That means the muffins would cost 28p each in total – way higher than the cookies or biscuits made from scratch. No wonder I avoid mixes. 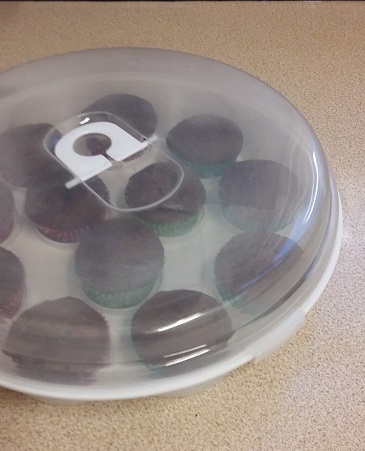 I even got to try out my cupcake carrier from Poundland, purchased for all of (you’ve guessed it) £1. Muffins transported in Poundland’s finest. It is a bit flimsy, but hey it does the job. It only has the space for 12, so I kept four muffins in the tin for post-swimming lesson sustenance and packed lunches. I also used up one more of the packets in my storecupboard, so the muffins were a winner all ways round. After the weekend, my daughter wanted to do some cooking too, and specifically requested chocolate chip cookies. I tried arguing for raisins, but no, only chocolate chips would do. This was slightly tricky as we didn’t have any chocolate chips, but we did have a part-opened pack of value-range dark cooking chocolate, so I chopped that up instead. I use this tried-and-tested Netmums recipe for easy chewy soft cookies. It doesn’t use any egg, so if you make the biscuits with raisins, and use Stork in a bar rather than a tub, they’re dairy free. 50g chocolate chips, or raisins, or chopped up chocolate, or whatever you fancy really. Mix the Stork or butter, sugar, syrup and vanilla extract together. Then add the flour and chocolate, and mix again. Divide the mixture into about 15 pieces and roll into balls between your hands. Space them out on a greased baking tray. I do flatten them a bit, even if the original recipe tells you not to. 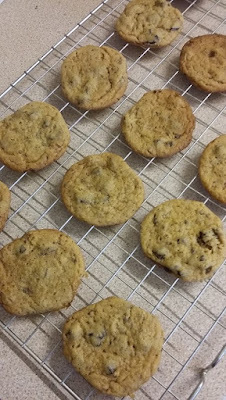 Bake for about 10 minutes if you want chewy cookies, and a bit longer if you like them to go crispy. Haul them out of the oven, leave to cool for a few minutes, and transfer to a wire rack. Will keep for a few days in an airtight tin if they don’t get eaten beforehand. As my son said yesterday evening: “These aren’t good, they’re DELICIOUS”. He then went off to Beavers with chocolate on his face, which I only noticed when collecting him at the end. Sigh. Prices based on shopping list from Morrisons, unless otherwise specified. Looks like Holland & Barrett sells the bags of Provena Gluten-Free Chocolate Muffin Mix with Chocolate Chips, 300g for £3.79. Disclaimer: no sponsorship, no freebies, just the ingredients, equipment and recipes I use. Okey doke I'll dig out the draft Degustabox post. Think a lot depends on whether you like snack & packet foods, but 2 boxes for £5.99 sounds like a good price if they're normally £12.99 each. I was genuinely shocked when I ran the figures for the muffin mix compared to the biscuits. Cooking from scratch, even with more expensive gluten-free flour, would be cheaper than the mix and surely can't be much more faff. Those are ANZAC biscuits – they're never called anything else by our lot. I guess the book named them New Zealand biscuits because the average non-down-under-er wouldn't know what ANZAC is 🙂 It stands for Australian and New Zealand Army Corps and they were sent to the soldiers in care packages during the wars. You can control the chewy-ness by how long they're cooked.